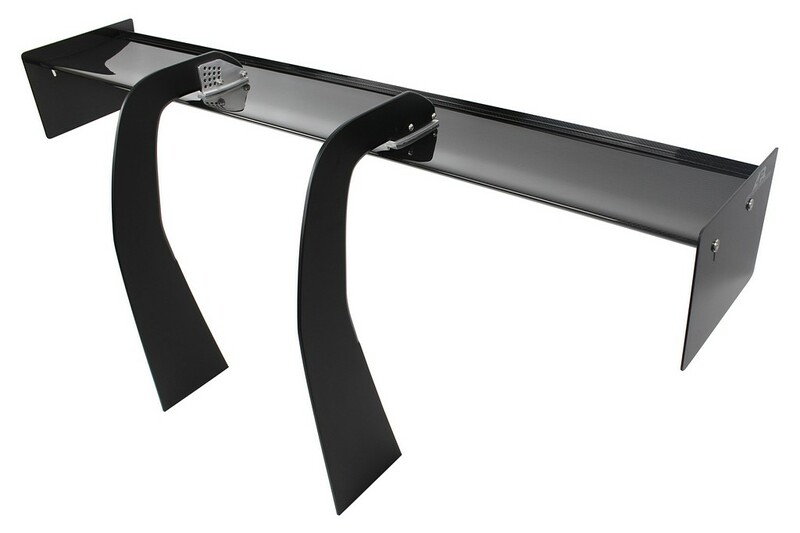 Spanning up to 71 inches over its optimized 2D airfoil shape, the APR Performance GTC-250 Adjustable Wing Swan Neck supplies maximum downforce in widebody sports and touring car applications. Swan Neck mounting maximizes effective airfoil surface area and minimizes flow separation. The APR Performance GT-250 Adjustable Wing Swan Neck features a 2D airfoil shape that is designed to produce great downforce with minimal drag. 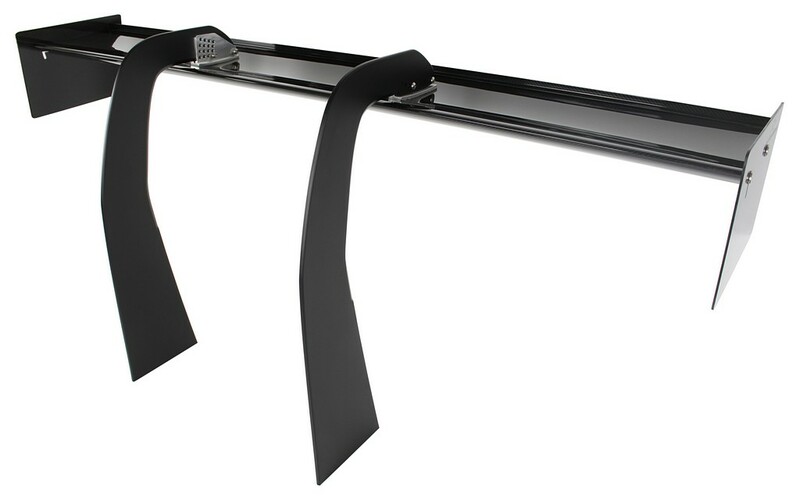 Swan neck pedestals prevent downforce-robbing flow separation commonly found in standard bottom-mount pedestals. The swan neck design allows greater Angle-of-Attack (AOA) before stalling occurs, when compared to standard bottom-mount pedestal configurations. The GT Series airfoil is composed of lightweight and durable pre-preg carbon fiber composite materials for superior strength and low weight. 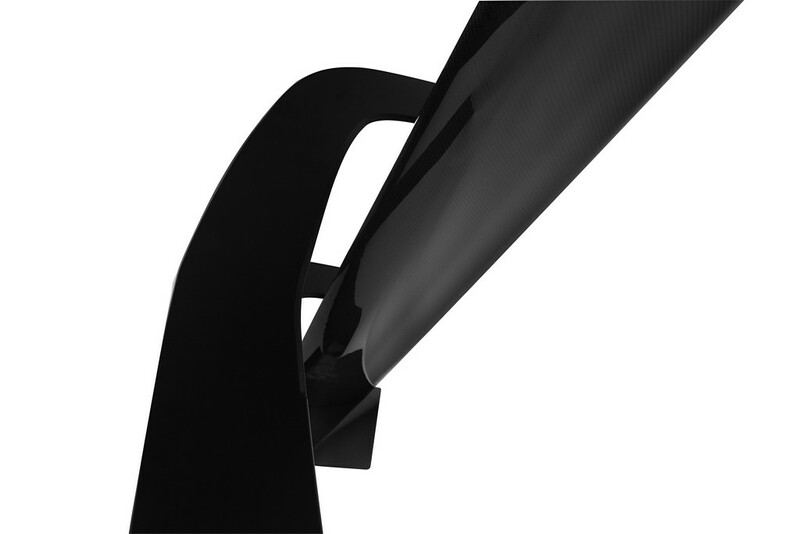 For the swan neck application, the airfoils are internally reinforced differently from the non-swan neck airfoils. Supporting the airfoils are 10mm "aircraft grade" 6061 billet aluminum swan neck pedestals that come in a flat black powder coat finish. Each swan neck pedestal is also "knife-edged" at the trailing edge, to minimize the amount of "dirty" air that reaches the airfoil. * Note: Upper brackets shown in photos are raw aluminum (for illustration purposes only). All production units come powder-coated in black color (same as the pedestals). Modeled in 3D and validated using Computational Fluid Dynamics (CFD), the APR Performance GT-250 Adjustable Wing is designed to adapt to a variety of widebody sports and touring car applications. Contained herein are the data and results of the Computational Fluid Dynamics (CFD) analysis that was conducted on the GT-250 airfoil. 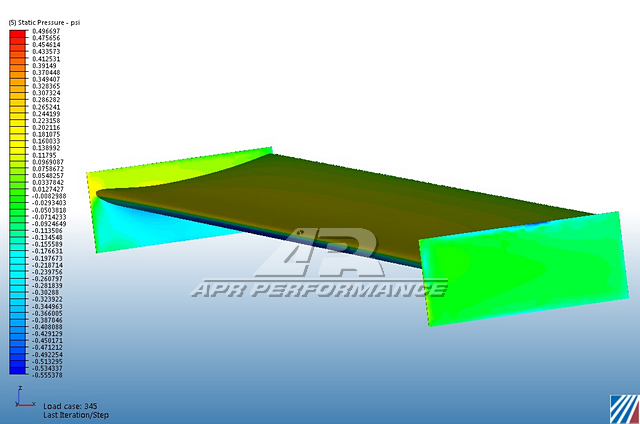 This data illustrates how the airfoil performs in different conditions by comparing Downforce vs. Angle-of-Attack (AOA) vs. Speed, and Drag vs. AOA vs. Speed. This data will provide insight with regards to how and how much the airfoil performs with respect to these conditions. 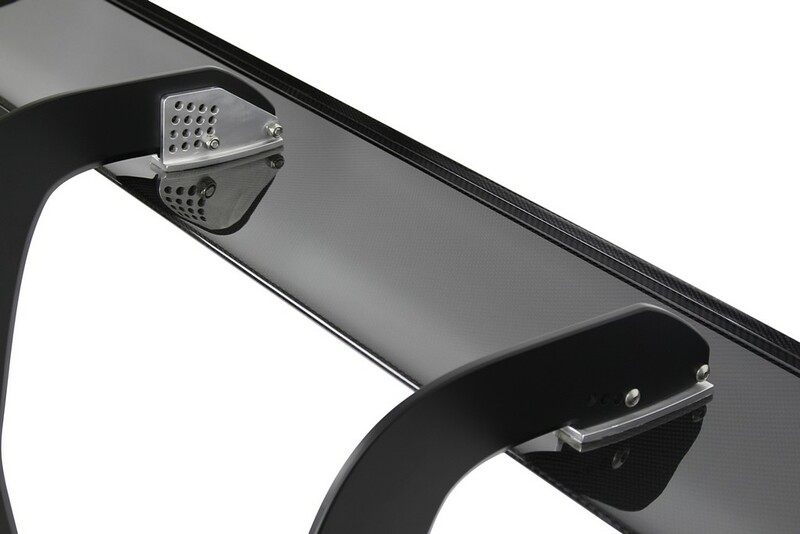 Gurney flaps are included with every APR Performance GT-250 Adjustable Wing. These are super lightweight, made using pre-preg carbon fiber processes, and pre-attached using double-sided tape. Custom applications only (chassis-mounting required). Custom pedestal-to-pedestal distance, built-to-order. Swan Neck pedestals are included. Chassis mounts must be custom-built by qualified fabricator. User assumes full responsibility for ensuring proper installation as intended. Professional installation by well-qualified personnel is highly recommended. To insure proper function and reliability, APR advises against modification or substitution of any component of the intended installation. Any modification or substitution of the airfoil, side plates, mounting brackets, or hardware included with the wing kit may create unsafe operating conditions and ultimately cause this system to fail.